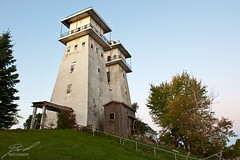 DNO_Dennis, Lawrence of Berkley, and I hit the Irish Hills Towers early Sunday morning to capture them in the light of the fall sunrise. This roadside attraction was constucted in 1924, unwent majot renovation in 1972, then finally closed in 2000. Only a couple years ago the towers made it onto the National Register of Historical Places (NRIS07000380). In the time that the towers have been closed the siding started to come down and the downs are showing neglet despite someone's attempt to at least keep up with the mowing and debris. With all the roadside history disappearing from the area I'd love to see this property be restored and converted to a museum for Michigan's Roadside Attractions.